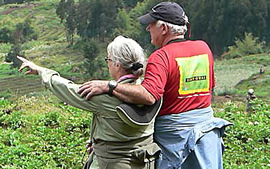 The 21 days Rwanda Uganda safari is an exceptional package which help you explore and enjoy all the attractions in Uganda and Rwanda. Enjoy city tours in Uganda and Rwanda, game viewing and boat cruise in Murchison falls/Queen Elizabeth national Park, Chimpanzee trekking in Kibale forest national park, gorilla trekking in Bwindi/ golden monkey trekking and dian Fossey hike in Volcanoes national park and canopy walk in Nyungwe forest National park. 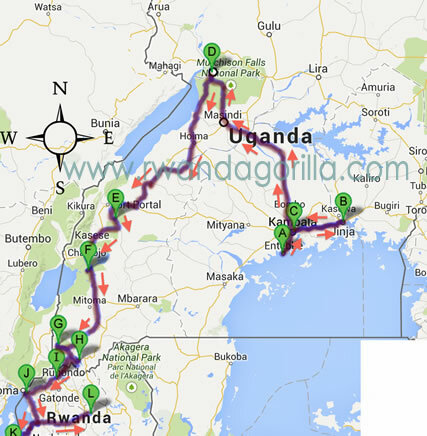 The safari starts in Uganda and ends in Rwanda. At 9:00am, you will be picked from your hotel set off to Murchison Falls National park, reaching Ziwa Rhino sanctuary by 12:00am for Optional Rhino Tracking. (You will pay USD30@ in case you choose to track the Rhinos) After habituating the Rhinos for 1 hour, you will continue to Masindi reaching by 1:30pm, and have lunch at Kabalega Resort [Just before Masindi town]. You will then continue to Murchison National park reaching by 3:00pm. You will then visit the top of the falls and later drive to Paraa Safari Lodge(luxury) / Pakuba Safari Lodge(mid-range)/Red Chille Hide-out(budget). In the morning, you will wake up early to go for morning game drives to be able to catch up with early risers like lion, leopard, hyenas, bush bucks, among others before they return to their hiding places. Return to the hotel for late breakfast, relaxation as you wait for lunch. After lunch, you will enjoy a boat cruise to the bottom of the Victoria Nile falls which will reward you with view of game as hippos, crocodiles, buffalos, elephants as well as a variety of bird species. Dinner and overnight stay Paraa Safari Lodge(luxury) / Pakuba Safari Lodge(mid-range)/Red Chille Hide-out(budget). After breakfast, you will embark on a scenic journey to Fort Portal, a beautiful town overlooking the mountains of the moon. Taking the Western scenic route to Kibale National Park, this journey will take you through the Albertine rift found in the Western arm of Great East African rift valley. Reaching Fort Portal early evening, relax and refresh at the Lodge. Dinner and overnight at Crater Safari Lodge(luxury),Primates lodge(mid-range), Chimpanzee Forest Camp(budget). Have an early morning breakfast and drive to the park headquarters for the chimpanzee briefing by the forest guide. You will locate the chimps by listening for their pant-hooting calls, then hustle to the area from which they are calling. You will see more other primates such as the red colobus, black and white colobus and the red-tailed monkey. After lunch, head for a Bigodi swamp walk, where you will see over 138 different bird species including the great blue turaco, plant species, and butterflies will be seen in the forest. Dinner and overnight at Crater Safari Lodge(luxury),Primates lodge(mid-range), Chimpanzee Forest Camp(budget). After breakfast, drive to Queen Elizabeth National Park, with game drive while entering the park. On your arrival, have lunch and proceed for the launch cruise on the Kazinga Channel. Different animals that come to drink water at the channel and water birds will be viewed along the shores such buffallos, elephants, school of hippos, crocodiles as well as a variety of bird species. Dinner and Overnight at Mweya Safari Lodge(luxury) / Enganzi Lodge(budget) / Park View Lodge(Mid-range). After breakfast, transfer to Bwindi NP via Ishasha sector with game drives search of the famous tree climbing lions which are always spotted clinging on old fig trees. Proceed to Bwindi Impenetrable National Forest found in the southern part of the country. On your arrival, you will relax at the lodge while preparing for the gorillas the next day. Dinner and overnight at Bakiga Lodge (mid-range), Gorilla Mist Camp/Gorilla Safari Lodge/Chameleon Hill Lodge(luxury). Early in the morning after breakfast and briefing by a ranger guide, enter the forest for your gorilla tracking adventure. The steeply forested landscape is incredibly dense but criss-crossed by numerous animal trails allowing access to tourists. Tracking may take 3-9 hours depending on the movements of the gorillas in their natural wild. You will stay with the gorillas for a maximum of one hour once you encounter them, and then transfer back to your lodge for relaxation. If still early, you may go for community walk in the evening to visit the Batwa (pygmies) and get entertained with their traditional dances. Dinner and overnight stay Bakiga Lodge (mid-range), Gorilla Mist Camp/Gorilla Safari Lodge/Chameleon Hill Lodge(luxury). In the morning after a relaxed breakfast, you will set off to Lake Kivu, where you will enjoy a boat ride to the coffee island, the hot springs, the Goma-Congo Boarder, a clear view on Nyiragongo volcanoe. Dinner and overnight at Malahide Paradise (Budget)/(Stipp Hotel(Deluxe)/Lake Kivu serena Hotel(Luxury). Day 17: Fully day beach relaxation and boat cruise around the surrounding islands. Dinner and overnight stay. After a relaxed breakfast, you will set off to Nyungwe forest national park, with en route stopovers for scenic photography and lunch. Reach Nyungwe in the afternoon for dinner and overnight at Gisakura hotel (Budget)/Nyugwe top view hotel (Deluxe)/Nyungwe forest Lodge (Luxury). In the morning, you will enjoy a breathtaking canopy walk, which will give you a clear top view of the Nyungwe forest, view waterfalls and a variety of birds at eye-level contact. In the afternoon, embark on colobus monkey tracking where you will encounter other 12 primate species along the track. Dinner and overnight stay. In the morning, you will set off for a drive to Kigali, with en route visit to the museums, Nyanza king’s palace, among others. Reach Kigali in the afternoon for a city tour. Dinner and overnight at Flame Tree Village (Deluxe) /Serena Hotel (Luxury)/Garr Hotel (Budget). Depending on your departure flight, you will have an additional Kigali city tour to visit areas you will have missed the previous day. Later, you will be transferred to the airport for you departure flight.